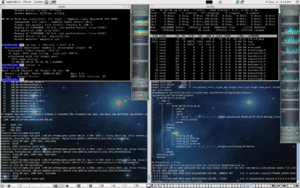 Screenshot of qemu/KVM running NetBSD, OpenSolaris and Kubuntu on an Linux host. LIO v3.0 across KVM Guests on Neterion X3110 10 Gb/sec Ethernet hardware using PCIe device passthrough. TCM v4.0 QLAXXX prototype using PCIe device passthrough for target mode MSI-X interrupts, and QEMU Megasas HBA emulation into Windows7 64-bit guest. TCM v4.0 QLAXXX prototype using PCIe device passthrough for target mode MSI-X interrupts, and QEMU Megasas HBA emulation into Debian guest. Kernel-based Virtual Machine (KVM) is a Linux kernel virtualization infrastructure. KVM supports native virtualization on x86 processors that provide Intel VT-x or AMD-V extensions; it has also been ported to S/390, PowerPC, IA-64, and an ARM port is in progress. Using KVM, it is possible to use both Datera, Inc. SCSI initiators and LinuxIOs inside of KVM guests at high bandwith speeds using PCI Express (PCIe) device passthrough. Although doing PCIe device passthrough is not a requirement for using initiators and targets in KVM guests, this page focuses on 10 Gb/sec Ethernet hardware capable of single function operation, multi-function operation, and future PCIsig SR-IOV (included in v2.6.30-rc) and MR-IOV capable networking hardware. 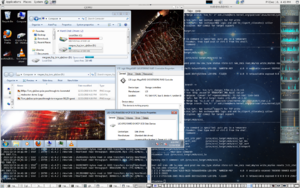 FILEIO and RAMDISK storages objects are exported from KVM guests to other Linux instances via using iSCSI in Demo Mode. RAMDISK storage objects are using a 64 slot queue depth. The struct socket->sock_ops->sendpage() has been disabled for outgoing bulk struct scatterlist TX traffic (eg: iSCSI READ) in LIO code (it is usually enabled by default). This was done because sendpage() currently triggers a bug with the X3110 adapter in the KVM guest, and has been disabled for these tests. Both Core-iSCSI and Open-iSCSI Initiators can be used on kernel v2.6.29.2 inside of KVM guest. Core-iSCSI is using between 1 and 4 iSCSI connections per iSCSI session. Also, struct socket->sock_ops->sendpage() triggers a bug in KVM guest with vxge, so unforutately it is not possible to obtain Open-iSCSI WRITE and WRITE/READ numbers yet.. These correspond to struct scsi_host_template->can_queue and struct scsi_host_template->can_queue->cmd_per_lun settings. The Open-iSCSI module is from upstream linux-2.6.29.y.git. Open-iSCSI is using 1 iSCSI connection per iSCSI session. Open-iSCSI is using its default values for can_queue and cmd_per_lun which are 128 and 32 respectively. The first tests focus on using RAMDISK and FILEIO storage objects using 10 GbE adapters. Of course, IBLOCK storage objects (SAS, SATA, SSD, etc.) work across the 10 GbE and iSCSI fabric as well. It is also possible to use Linux dm-multipath for scaling across multiple iSCSI sessions to the same LinuxIO and iSCSI Target Port using both Open-iSCSI and Core-iSCSI. However, tests here focus on iSCSI MC/S and SC/S to evaluate which configuration provides maximum bandwith to the underlying Linux/SCSI struct scsi_device referencing an iSCSI LUN in a KVM guest. CPU RAM: The KVM Host used was a Tyan S7010 with a Intel IOH-5520 chipset using dual Xeon E5520 microprocessors and 8 GB of 1033 Mhz DDR-3 ECC memory. Ethernet: two Neterion X3110 10 GbE PCIe Single-function/Multi-Function capable adapters are being passed using PCIe device passthrough into KVM/QEMU guests. 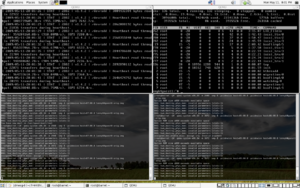 OS: The KVM host runs linux-2.6.git (2.6.30-rc3) on Fedora 11 x86_64 preview. Each KVM guest is assigned a Neterion X3110 10 GbE adapter running in single-function (SF) mode. Each of these adapters has a total of 8 Vpath pairs (a TX and RX MSI-X interrupt pair for each Vpath) and each Linux KVM guest is using 4 of the 8 VPaths available for each adapter. Core-iSCSI read/write (bi-directional) throughput with MC/S scales a single Linux/iSCSI LUN to 10 Gb/sec line-rate speeds (>1200MB/s). Core-iSCSI read (uni-directional) throughput with MC/S average is about 6-7 Gb/sec. Core-iSCSI write (uni-directional) throughput with MC/S average is about 5 Gb/sec. | 2009/05/14-18:56:20 | STAT  | 2767 | v1.4.2 | /dev/sda | Total read throughput: 431091438.9B/s (411.12MB/s), IOPS 1644.5/s. This test could not effectively be performed because an Open-iSCSI problem: Unable to use sendpage() for iSCSI WRITE. | 2009/05/14-17:59:31 | STAT  | 3334 | v1.4.2 | /dev/sda | Total read throughput: 773110715.7B/s (737.30MB/s), IOPS 2949.2/s. | 2009/05/14-18:04:34 | STAT  | 3406 | v1.4.2 | /dev/sda | Total read throughput: 922808046.9B/s (880.06MB/s), IOPS 3520.2/s. | 2009/05/14-18:07:32 | STAT  | 3478 | v1.4.2 | /dev/sda | Total read throughput: 849608704.0B/s (810.25MB/s), IOPS 3241.0/s. | 2009/05/14-18:13:56 | STAT  | 3551 | v1.4.2 | /dev/sda | Total read throughput: 848656247.5B/s (809.34MB/s), IOPS 3237.4/s. | 2009/05/14-18:20:53 | STAT  | 3929 | v1.4.2 | /dev/sda | Total write throughput: 546032844.8B/s (520.74MB/s), IOPS 2082.9/s. | 2009/05/14-18:22:52 | STAT  | 3999 | v1.4.2 | /dev/sda | Total write throughput: 661498538.7B/s (630.85MB/s), IOPS 2523.4/s. | 2009/05/14-18:24:13 | STAT  | 4072 | v1.4.2 | /dev/sda | Total write throughput: 575069661.9B/s (548.43MB/s), IOPS 2193.7/s. | 2009/05/14-18:27:24 | STAT  | 4145 | v1.4.2 | /dev/sda | Total write throughput: 583161173.3B/s (556.15MB/s), IOPS 2224.6/s. | 2009/05/14-17:51:16 | STAT  | 2815 | v1.4.2 | /dev/sda | Total read throughput: 550266470.4B/s (524.77MB/s), IOPS 2099.1/s. | 2009/05/14-17:51:16 | STAT  | 2815 | v1.4.2 | /dev/sda | Total write throughput: 550266470.4B/s (524.77MB/s), IOPS 2099.1/s. | 2009/05/14-17:52:30 | STAT  | 2891 | v1.4.2 | /dev/sda | Total read throughput: 716605576.5B/s (683.41MB/s), IOPS 2733.6/s. | 2009/05/14-17:52:30 | STAT  | 2891 | v1.4.2 | /dev/sda | Total write throughput: 716614314.7B/s (683.42MB/s), IOPS 2733.7/s. | 2009/05/14-17:53:41 | STAT  | 2964 | v1.4.2 | /dev/sda | Total read throughput: 727231146.7B/s (693.54MB/s), IOPS 2774.2/s. | 2009/05/14-17:53:41 | STAT  | 2964 | v1.4.2 | /dev/sda | Total write throughput: 727231146.7B/s (693.54MB/s), IOPS 2774.2/s. | 2009/05/14-17:56:28 | STAT  | 3176 | v1.4.2 | /dev/sda | Total read throughput: 741133516.8B/s (706.80MB/s), IOPS 2827.2/s. | 2009/05/14-17:56:28 | STAT  | 3176 | v1.4.2 | /dev/sda | Total write throughput: 741142254.9B/s (706.81MB/s), IOPS 2827.2/s. ↑ Sergey Kiselev (2007-04-26). "kvm-20 on SLES 10 fails". gmane.comp.emulators.kvm.devel. ↑ Igor Serebryany (2010-11-20). "OOM kernel panic on bootup in debian/ubuntu guests". gmane.comp.emulators.kvm.devel. ↑ "KVM for ARM wiki". This page was last modified on 17 November 2013, at 00:42.